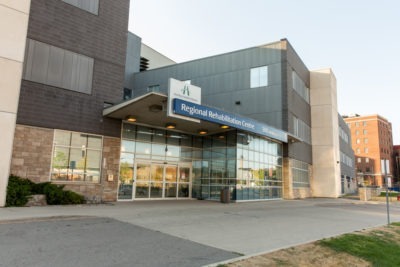 The Acquired Brain Injury (ABI) Program at Hamilton Health Sciences’ Regional Rehab Centre serves the rehabilitation needs of adults with acquired brain injuries and their families. Our program provides specialized care to Provincial, Regional and local patients and spans the spectrum of service including inpatient rehabilitation units, community outreach and consultative services. The model of service delivery revolves around the goals of the individual with ABI and his/her family, in discussion with the treatment team. These goals are defined in very specific terms and are measured with a comprehensive system of data collection and analysis. A team of health care professionals works together with the individual and his/her family towards the achievement of the rehabilitation goals. Neurobehavioural Rehabilitation Service (B3 North) is a provincial program providing assessment and treatment to individuals with an ABI and subsequent complex behaviour and/or mental health challenges. Slow to Recover Program (B3 South) is one of 3 inpatient programs which supports the needs of individuals who have sustained a severe brain injury and resulting complex needs requiring intensive treatment. Community Re-integration Program (B3 South) is one of 3 inpatient programs supporting the needs of individuals with moderate to severe brain injury. Treatment focuses on assisting individuals to regain a level of independence sufficient to reintegrate into the community.